[INQ. NO. 1609M02] Jeil Engineering & Ind. has been contributing to Korea’s development of reducers, various gears, and power transmission since its establishment in 1994. With more than 30 years of industrial experience, Jeil Engineering & Ind. has elevated the performance level of its products – reducers, geared motors, electric actuators, and coupling and various gears. The gear reducer (box) manufactured by the company is an essential component in such industrial power transmission areas as steel, chemicals, and power generation equipment. In the manufacturing process, the maker focuses on delivering high efficiency, and high performance of torque, which solved problems of noise, vibration, etc. It manufactures various kinds of gears – helical gears, bevel gears, planetary gears, spur gears, worm gears, etc. depending on the user’s specific orders. Jeil’s cyclo reducer features lighter and compacter than others. Various ratio of service is available. It can be used for any kinds of industrial facilities for steel, chemical, and logistics. It can be divided into two types – vertical and horizontal type and be variously utilized according to orders. Based on thorough craftsmanship, mod cons and reasonable line of product construction, personal is trying to become a company that leads the development the industry not only of Korea, but also of overseas market. It is always ready to cooperate with competitive potential partners in global market in the field of green energy. [INQ. NO. 1510M33] Jeil Engineering&Ind. has been contributing to Korea’s development of reducer, various gear, and power transmission since its establishment in 1994. Started with more than 30years of industrial experience, Jeil Engineering&Ind. has elevated the performance level of its products – reducers, geared motor, electric actuator, coupling and various gears. Gear reducer (box) manufactured by the company is an essential component in such industrial power transmission area as steel, chemical, power generation equipment. In the manufacturing process of it, the maker places its weight in delivering high efficiency, high performance of torque, which solved problems of noise, vibration, etc. It manufactures various kinds of gears – helical gear, bevel gear, planetary gear, spur gear, worm gear, etc. depending on user’s specific orders. [INQ. NO. 1505M21] Jeil Engineering&Ind. has been contributing to Korea’s development of reducer, various gear, and power transmission since its establishment in 1994. Started with more than 30years of industrial experience, Jeil Engineering&Ind. has elevated the performance level of its products – reducers, geared motor, electric actuator, coupling and various gears. Woorim Machinery specializing in reducer has developed reducers and precision gears that are used for steel manufacture, shipping, cargo working, shipbuilding, construction, generation of electric power, plant and heavy machinery for the past 32 years. In addition, Woorim Machinery has outstanding technological strength in Gear Box and Pitch/Yaw Drie for wind power generation, mill reducer for steel manufacturing plant, engine gear and press gear based on excellent know-how in design, development and production of reducers and precision gears. For industrial reducer, Woorim has concentrated on developing high performance and functional reducers coping with the miniaturization trend for steel manufacture, industrial equipment, cargo transporters, tower cranes and excavators. 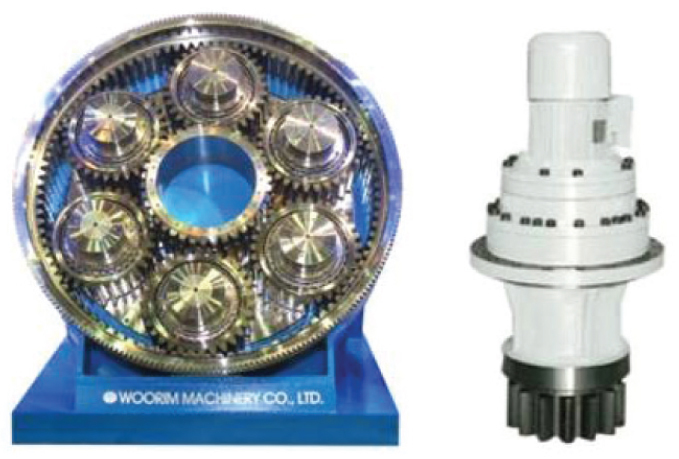 Woorim’s ability in technological design has led to series of continuously upgraded reducer models. This maker has comparative advantages over its competitors in such points as automated processing equipment, specialized assembly line and reliability verification equipment. And as the huge growth in the field of eco-friendly energy is expected in the foreseeable future, the maker is concentrating on the key ability to develop wind power generation parts. Filed Under: KOTRA Tagged With: engine gear and press gear, Industrial Reducers, mill reducer for steel manufacturing plant, Pitch/Yaw Drie for wind power generation, precision gear, Woorim Machinery Co. Ltd.
Woorim Machinery specializing in reducer has developed reducers and precision gears that are used for steel manufacture, shipping, cargo working, shipbuilding, construction, generation of electric power, plant and heavy machinery for the last 30 years. In addition, Woorim Machinery has outstanding technological strength in Gear Box and Pitch/Yaw Drie for wind power generation, mill reducer for steel manufacturing plant, engine gear and pressgear based on excellent know-how in design, development and productionof reducers and precision gears. For industrial reducer, Woorim has concentrated on developing high performance and functional reducer coping with miniaturization trend – for steel manufacture, industrial equipment,cargo transporter, tower crane and excavator. 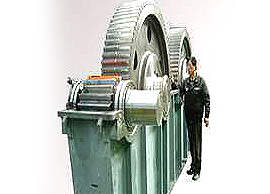 Woorim’s ability in technological design has led to series of continuously upgraded reducer models. This maker has comparative advantages over its competitors in such points as automated processing equipment, specialized assembly line and reliability verification equipment. And as the huge growth in the field of eco-friendly energy is expected in the foreseeable future, the maker is concentrating on the key ability to developwind power generation parts. Filed Under: KOTRA Tagged With: Gear Box and Pitch/Yaw Drie, Industrial Reducers, Woorim Machinery Co. Ltd.